In late 1942, Manhattan Project head Gen. Leslie R. Groves selected the DuPont Company to build the world’s first nuclear reactors and chemical reprocessing plants that would create plutonium for atomic bombs. As with the uranium enrichment plants at Oak Ridge and the atomic bomb research facilities at Los Alamos, Hanford’s plutonium facilities needed a very large tract of relatively unpopulated land to preserve the security of these top secret facilities and protect the surrounding population from the hazards of chemical and radionuclide releases.After searching for potentially acceptable sites in California, Montana, Oregon and Washington, officials selected a 670-square mile area in southeast Washington state to build these plutonium production plants. The area was ideal because it was isolated had a moderate climate; held ample sand and gravel deposits for construction; was located near the Columbia River for pumping water to cool the reactors; and laid south of the newly constructed Grand Coulee Dam, which could supply a substantial amount of electric power to operate Hanford. Initially known as “Site W,” or the Hanford Engineer Works, this sparsely populated, desert area soon became the third largest city in Washington state, holding about 50,000 workers at the height of the Manhattan Project. 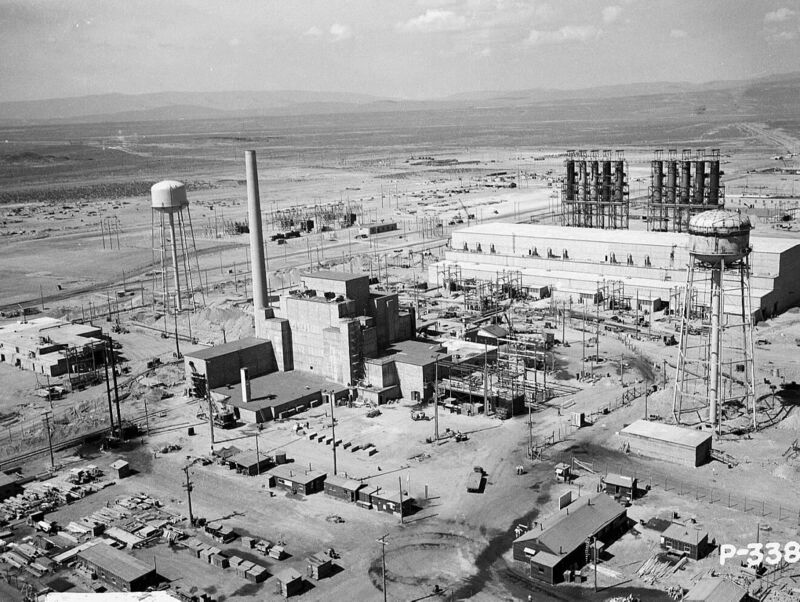 During this period, workers built three nuclear reactors to make plutonium, three chemical reprocessing plants to recover the plutonium from irradiated uranium fuel, more than 500 support facilities, and tank farms to store the highly radioactive liquid waste created from fuel reprocessing. Hanford required massive resources to build reactors and safely perform the chemical separation processes necessary to extract plutonium, an element only identified three years earlier. In the first steps of the production process, uranium was machined into fuel elements and spaced in an optimum configuration inside graphite moderated reactors. After irradiation by neutrons in the reactors, the uranium fuel was taken to huge chemical plants and dissolved in acid and caustic chemical-mixtures. The fraction of plutonium that had formed in the uranium fuel was separated from unwanted byproducts and wastes in a complicated “wet chemical” process. Initially, all of these steps were largely based on scientific theories and small-scale experiments. But in less than two years after the government acquired Hanford land, full-scale reactors and reprocessing plants were operating. The first full-scale plutonium production reactor, known as the B-Reactor, went critical (meaning its nuclear chain reactions became self-sustaining) in September 1944. Several months later, in February 1945, Hanford delivered the first shipment of plutonuium-239 to the Los Alamos Site. Scientists used this plutonium to build the world’s first atomic bomb, “Trinity” or “the Gadget,” that was detonated in Alamogordo, New Mexico on July 16, 1945; and “Fat Man,” the atomic bomb dropped on Nagasaki, Japan, on Aug. 9, 1945 to end World War II. To accommodate the massive influx of workers, the U.S. government built the Hanford Construction Camp. It consisted of more than 1,000 barracks, huts, trailers, and dormitories, and contained facilities for dining, recreation, banking, medical care, barbering, shopping, repairs and mail service. Following World War II, Hanford played a primary role in Cold War defense plutonium production. The site expanded to hold nine reactors and five chemical processing plants, and a plutonium finishing plant that produced plutonium metal for most of the United States’ nuclear weapons that were manufactured in the Cold War. In the 1960s, the U.S. government began moving weapons programs to other sites, and the Hanford Site transitioned to non-defense operations, including scientific research and testing, commercial nuclear power production and the largest environmental cleanup project to protect the nearby Columbia River and surrounding environment.